Reaching the Laurentians, the woodlands, was astonishing. A huge swath of mountainous, lake studded territory stretched as far as the eye could see. A particularly good setting. Besides being captivated, working with the elements at hand at times was intimidating for Gerald. The images were just flawless. He would stand at his easel for long periods and tired easily. One late afternoon with weary eyes, Gerald made an unexpected remark to his wife. He felt his time was running out at a fast pace but assured her the dream carries on, as nothing will interfere. The final stretch and most enchanting journey would be where sea and sand come together to create a landscape unmatched by others. The Gaspé Peninsula in Quebec boasts an array of unique images; quaint little fishing villages, dirt streets, wooden boardwalks and brightly painted yet dilapidated wooden houses. Gerald had an affinity for waterscapes. He had studied the interplay of light and shadow on water to bring depth and layer to a notoriously difficult subject. Where a touch of light might create a dramatic scene, Gerald had a stylized approach to this realism. The only dark reality was he had to endure a daunting trek across the mountainous wilderness which caused him to succumb to exhaustion too easily. The prognosis was relatively simple - curtail his activities. This experience affected him so profoundly it led him to the shores of Gaspé prematurely. He fought to remain strong but failed miserably. Gaspé offered Gerald some of the most spectacular and rugged coastal scenery on the East Coast. He set about capturing some of those unique images. On the one hand, it was a quiet time to enjoy the solitude. On the other he took great pleasure in socializing with the locals. When painting, the task required complete concentration therefore it was a necessity to make his way to remote areas to find complete seclusion. Before very long, Gerald encountered spectators who expressed their desire to purchase his art. Françoise would politely ask the onlookers to disperse without success. This come as a rude shock to her. The admirers frequently followed them from one site to another. As a result of these more and more constant interruptions, he decided to take his "Voyage de Découverte" (Journey of Discovery) down to the sea waters. On the day Gerald acquired his first boat he was like a child at play. He was firmly committed to rowing his boat to his destinations. Spending hours at anchor, he approached his medium with ease and fortitude. Though there were bouts of motor envy. He wished nothing more than to be exactly where he was - off the shore lines of Gaspé. It was a perfect vantage point to paint the grandest scenery of Gaspé. Gerald discovered while undertaking this route by boat that it was the best way for him to capture the finest raw images. It was always a challenge to catch the inland sea waters on a calm day. If the wind gets up, without warning, it can turn almost immediately into a raging swirl of white topped waves and sizable swells. If rain covered the coast line he would shield his body and paint board with a large tarp and continue painting. This process was repeated over and over again. Françoise would have marvelled at the notion she accompany her husband on his voyages. It was obvious Gerald preferred to drift alone and in silence. Gerald sensed his work was taking a new direction. His sense of color helped to establish him as a formidable artist. One evening Gerald endured a dream so vivid he awoke in a cold sweat. He couldn't shake the dream. It involved the burning of the cabin they were occupying in Gaspé. Despite Françoise's reassurances, it crippled his way of thinking. Gerald considered the possibility of this dream becoming a reality. He felt an urgency to relocate his art, from cabin to vehicle. 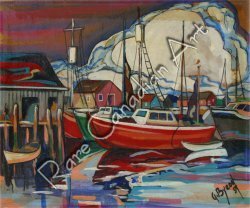 During their remaining four days in Gaspé, Gerald slept in the car with his precious paintings. Their pilgrimage then brought them back to Montreal.